This is the seventh post in a series about claims based identity management and the Windows Identity Foundation (WIF). In this post, we describe WIF’s class model for claims based identities. the AuthenticationType string property, with a description of the authentication method used to verity the name. The IsInRole(string) method that verifies if the subject possesses a given role. The Identity property that references an IIdentity. In this model a subject is solely characterized by a role membership function and a name based identity. We will see below that the new claims based model extends this information with claims collections. The concrete implementations of the IIdentity include: the GenericIdentity class, the WindowsIdentity class and the FormsIdentity class. The IPrincipal interface is implemented by classes such as: the GenericPrincipal class, the WindowsPrincipal class and the RolePrincipal class. The IClaimsIdentity interface derives from IIdentity and adds several new properties. The most important is the Claims property that references a claim collection. In this way, a identity is now much more that a single string-based name. The Claim class represents individual claims, which are characterized by a value, an issuer name and a type (the ClaimTypes class defines a set of common claim types). Finally, the IClaimsPrincipal interface derives from IPrincipal and adds the new Identities property that references a collection of IClaimIdentity. 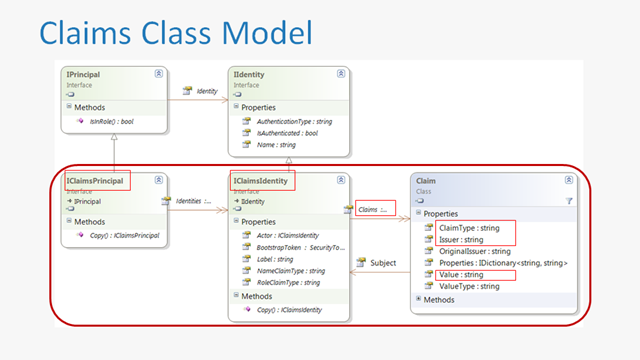 In its essence, the new model extends the old one by characterizing an identity not only by a name string but also by a claim collection, where a claim has a value, a type and an issuer. When using WIF, instances of this new model are exposed in the same places as before, namely by property System.Web.HttpContext.User. The new model also contains some methods and properties not address in this post, which are only relevant in delegation scenarios. This theme will be the subject of a future post. This entry was posted in Uncategorized and tagged claims, WIF on July 23, 2010 by pedrofelix. This is the sixth post in a series about claims based identity management and the Windows Identity Foundation (WIF). 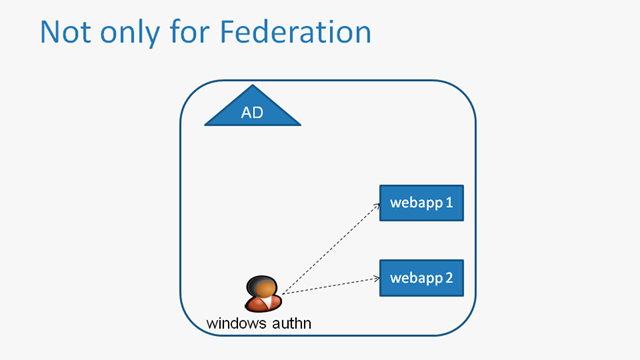 In this post, we introduce the Windows Identity Foundation – WIF. The FedUtil command line tool. A claims and token issuance pipeline. A claims and token consumption pipeline. Host adaptation layer supporting the above generic pipelines over the ASP.NET and WCF “hosts”. The FedUtil command line generates configuration files based on federation metadata. Identity consumers – ASP.NET sites and WCF services. Identity producers – ASP.NET and WCF based security token services. In the next post, we will begin our in-depth analysis of WIF by looking into the class model for claims based identity representation. This entry was posted in Uncategorized and tagged claims, WIF on July 13, 2010 by pedrofelix. This is the fifth post in a series about claims based identity management and the Windows Identity Foundation (WIF). In this post, we show that the claims based model is useful in scenarios other than federation. 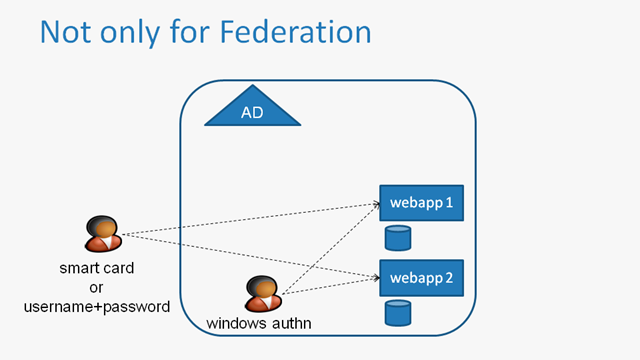 Considerer the scenario presented in the following figure, where webapp1 and webapp2 are intranet web applications, deployed inside a windows domain and using windows based authentication. The user identity is managed by Active Directory (AD), namely domain group membership. This user identity information is seamlessly made available to the web apps, using the integrated support for windows authentication available in ASP.NET. However, consider the augmented scenario depicted in the next figure, where access must also be available from outside the windows domains, using password based or certificate based user authentication. Note that, for security reasons, the used passwords may be different from the ones used in the domain. Since integrated windows authentication is not readily available in this scenario, each web app must deal with the identity management issues, namely authentication and group membership. This may imply the creation of credential and identity stores in each web app. In such a scenario, the usage of a claims based model, as showed next, solves this problems. 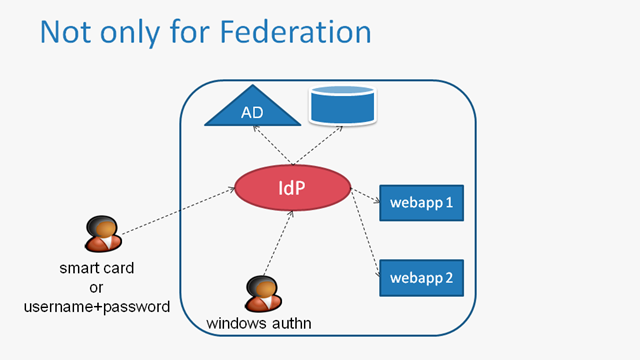 Users are initially authenticated by the Identity Provider (IdP), releasing the web apps from this burden. This also simplifies the introduction of new authentication mechanisms, because the web apps are not impacted by these changes. The web apps consume the claims (e.g. group membership, roles, authorizations) issued by the IdP. The claim issuance process can use other sources of information other than active directory, namely for storing user attributes that do not fit in AD’s schema. Any change to the user’s identity (e.g. role change) is readily made available to all the internal web apps. Authentication is not limited to windows mechanisms. User identity attributes are not limited to the ones stored in the AD. Namely, the claims issuance process may also include the evaluation of authorization policies, releasing the web apps from this task. By using commonly used specifications, it is easier to integrate application not based on Windows technologies. Domain users must access external apps, namely cloud based apps. This entry was posted in Uncategorized and tagged claims, federation on July 6, 2010 by pedrofelix. This is the fourth post in a series about claims based identity management and the Windows Identity Foundation (WIF). The previous post presented the protocols for requesting and exchanging security tokens between identity providers and identity consumers. In this post, we dissect the structure of a commonly used token type: SAML assertions. The following excerpt shows the high-level structure of a SAML 2.0 assertion. The top-level element is the Assertion element. The Assertion/Issuer element defines the token issuer’s identity, in the form of an URL. The Assertion/ds:Signature contains a signature computed over the assertion contents. The Assertion/Subject contains information regarding the assertion’s subject, i. e., to whom or what do the contained claims apply. This information is carried in the SubjectConfirmation element, which in this case states that this token is a bearer token: the token subject is anyone in possession of the token. Consumer identity (AudienceRestriction element). Any consumer that does not match any of the audience restriction URLs should not accept the token. Finally, the Assertion/AttributeStatement and Assertion/AuthnStatement contains the issued claims, which will be detailed next. Two role claims (type = “http://…/role”) with values “Developer” and “LeadDeveloper”. Finally, the next XML fragment shows the AuthnStatement element containing the authentication type claim, also called authentication context. In this example, Alice used a password based mechanism to authenticate herself when requesting the claims from the identity provider. For completeness, the next XML fragment presents the signature contents. The Signature/Element defines the signed data, which is this case is the complete SAML Assertion. Note that the URI attribute matches the ID attribute in the Assertion element. Since the signature is inside the signed data, an “enveloped-signature” transform is used. The Signature/KeyInfo/X509Data/X509Certificate contains the issuer’s certificate. There are several WIF configuration aspects that relate to this certificate, so its existence should be noted. This entry was posted in Uncategorized and tagged access control, claims, identity, protocols, SAML on July 5, 2010 by pedrofelix. This is the third post of a series about claims based identity management and the Windows Identity Foundation (WIF). The previous post presented the claims model, namely concepts such as identity provider, identity consumer, claims and security tokens. In this one, we will describe some of the protocols available for the communication between providers and consumers, namely for requesting security tokens and exchanging them. The protocol begins by Alice’s browser making the initial HTTP request to the web app. Since this request does not contain any identity information, the response is a redirect to the IdP. Alice’s browser fulfills this redirect by sending a GET request to the IdP. The redirect target URL contains information contextualizing the request, namely the identity of the requesting web app. After this request, typically there is an interaction between the IdP and Alice’s browser with the purpose of authenticating the user. For example, the IdP may respond with an HTML form for username+password authentication, which is followed by a POST containing this information, sent by Alice’s browser. This interaction may also include a step where the IdP and Alice agree on the issued claims, which is useful when Alice wants some control over releasing parts of her identity. An auto submitting HTML form, containing the token in an hidden field. The form’s target is the web app. 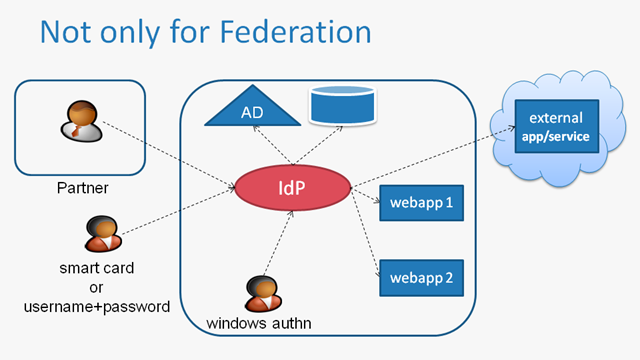 Both the WS-Federation and SAML protocols use the interactions described above. The SAML protocols have some variants not described above, namely the artifact binding. 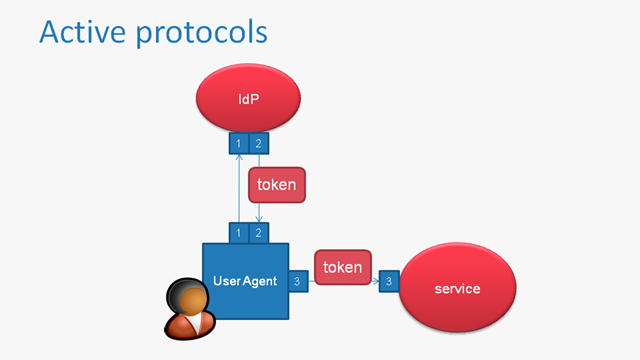 In the active protocols, the user-agent plays an active role in the protocols. 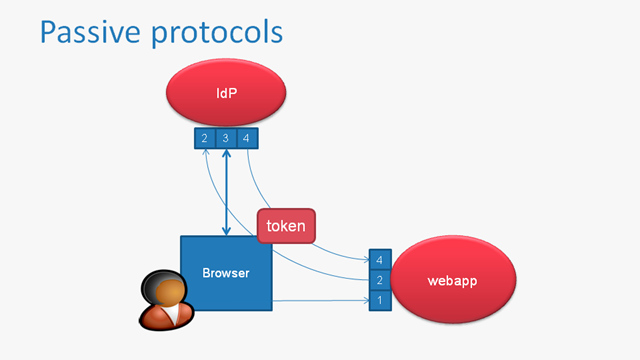 The protocol starts by the user agent directly requesting a token from the IdP. This request must contain all the information required for the IdP to authenticate the requesting user and determine the claims to issue. Next, the IdP responds with the issued token. Finally, the user agent sends the request to the Identity Consumer (typically a service), with the token attached. The WS-Trust is an example of an active protocols based using the SOAP and WS-* specifications. In the next post we will show some examples of security tokens, namely the SAML assertion format. This entry was posted in Uncategorized and tagged access control, claims, identity, protocols on July 1, 2010 by pedrofelix.